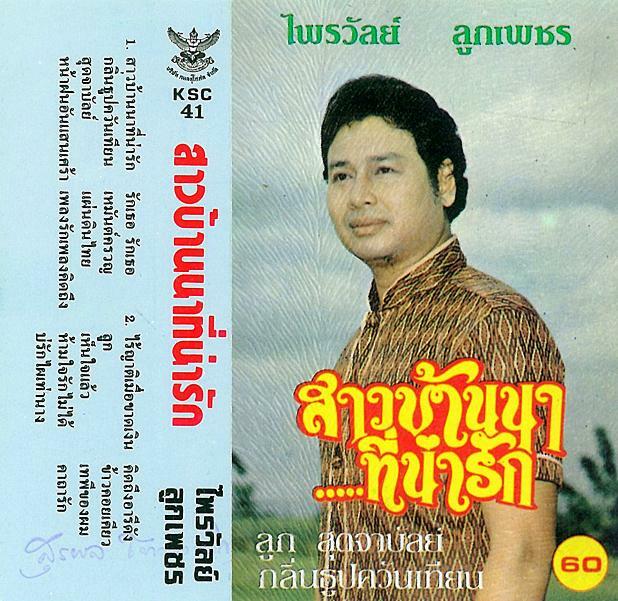 this week, another outstanding album from one of my favorite singers, mr. phraiwan lukphet! born in phetchaburi province, phraiwan was sent by his parents at an early age to join a local liké theatre troupe, but it was the world of popular music which called to him, and in time he left to join somphong wongrakthai's "bangkok cha cha cha" band. after this group dissolved, phraiwan was entrusted to suraphon sombatcharoen, in whose company he recorded his earliest hits (collected here). eventually he left suraphon's collective to persue a solo venture and with the aid of songwriter phaibun butkhan won massive reknown. his singing resonated through the film world especially, where he provided themes to many of the biggest motion pictures, two of which (mon rak luk thung and phlae kao) have been featured on this site. please enjoy the slow sweet sounds of phraiwan lukphet!! hello there.... i've been looking everywhere for an old thai tape of mine by an artist named Daochai Phaichit... i think she had a few tapes and i'm not sure the name of the album i am looking for but it makes me cry everytime i hear it. If you happen to find any of her stuff.... it would be great if you could post it. you'll know the right tape when you start crying during the first song ( just like when we cry during the last song on the 'mon rak luk thung' soundtrack by kathleeya marasi). Khop Khun Krap! i put all of the daochai songs i have up here for you. there's also a tune of her's of on this compilation. none of them brought a tear to my eye, so the song you have in mind may still be at-large. let me know! Thanks for those songs... they aren't from the same tape i had and maybe i'm just a big sook anyway. the tape i had featured whirring reverberated keyboard lines throughout (may well have been the poor quality of the tape i had though)... anyway... maybe it will appear one day. Yes, and thanks for don's version of 'Loy Kratong'... had been looking for that for ages. Superb!